finally here! This is the season that excites me most as a crocheter; the promise of crisp mornings crunching through frosty leaves, or spending an evening lit by candles and wood fires has me dreaming of woolly hats, squishy layers and natural shades. In this issue our designers have taken their inspiration from the wild nature of the British Isles and have used a range of natural fibres and muted shades to bring their designs to life. With inspiration from the TV series Outlander, the colour palette in this issue is warm browns and heathery mauves, with wrapped layers, capes and ponchos to provide warmth by the hearth or on a wintery walk. I particularly love the tweedy Coppice mitts (perfect for gathering pinecones as mantel decorations), the Cairngorm dress (a wonderfully textured must-have make) and the Twin Peaks cushions by Sarah-Jane Hicks (to snuggle in with a cup of hot chocolate!). There are also some beautiful last-minute gifts such as the Leaping Waves cowl by Rosina Northcott, which is perfect for a special few skeins of rustic yarn. 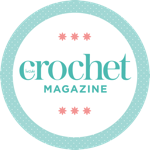 Of course, we love to see what our readers make, too, so don’t forget to upload your projects on Instagram with the hashtag #myinsidecrochet to be in with a chance of being featured in our makers’ gallery – or even win an annual digital subscription! Show us your makes!